The first day was supposed to start quickly but it started slowly. The reason was that the other drivers watch Bino Bill take the wrong turning and didn't tell him so he arrived opposite Annie's several suburbs late. After lots of heavy traffic leaving Brisbane and beyond we had a comfort stop at Tibrogargan, the mountain with the face on top. After passing the Glasshouse Mountains we pulled into a great strawberry farm and watching the pickers work on their three-wheel contraptions. Reject huge strawberries piled under a tree were enjoyed by many of us with no obvious ill-effects, until we got the "All aboard". We had morning tea at Mary Cairncross Park overlooking the coastal plain with the Glasshouse Mountains featuring as the major landmarks. Here we walked into the rainforest and saw noisy pittas and a rufous fantail and many other birds. Later we stopped over the Mary River and walked into the rainforest to see a huge fig tree and FL's favourite fig tree with the tin cans in the middle. Then we continued through the ranges on the back road to Gympie and had lunch there. The feature of the afternoon was a nostalgic tour of Maryborough seeing not only the important aspects of Queensland architecture but also a personal tour of FL's many family homes.� The final feature was a walk along one street and then meet a relative. 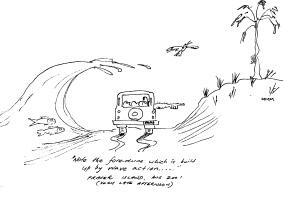 Coming into Hervey Bay the front three cars put on a burst through the traffic and again gave Bino Bill the slip while they went into the Mobil service station. So we didn't get into the Bay View Motel until after 6 pm. We had a great dinner at the Hervey Bay Boat Club with a good choice of menu and a chance to have a much welcome drink.� Then back to the motel and bed with several 4 am alarms set. Left Hervey Bay at 5,00am on board the Hombre taking in a great sunrise. 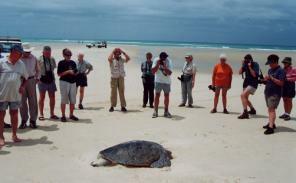 At a good 16 knot speed we eventually reached The Hervey Bay Marine Park where the fun began. We logged into www.whale.wow - which of course means wild whale watching - wow! Among the many sightings was a spectacular feeding session with Mum vertical with baby feeding and cavorting. Those of us who were swift enough should have a wonderful photograph.� We tracked the whales by the "footprints" and blowing as well as the breaching, pectoral slapping and fluke slapping. At Moon Point we watched a Busy Smithy transferring all vehicles from the barge to the beach. We had an easy landing on to the Fraser Dawn and then walked onto the beach - easy peasy! We proceeded to Arch Cliffs and set up camp at the ocean entrance of Bowarrady Creek. 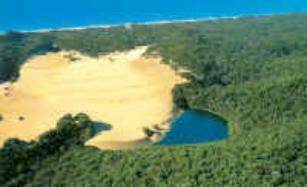 All tents were quickly erected and we again set off along the Woralie Track that runs from the eastern to the western side of Fraser Island. 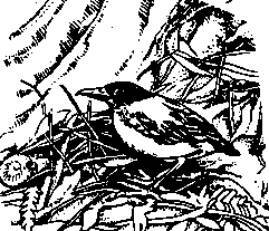 * Pied oystercatchers down to 10% of numbers due to disturbed nesting habits resulting from 4 wheel drive traffic. As we moved to rainforest areas we saw tall blackbutts, cycads, backhousia myrtifolia, kauri and hoop pines. Had lunch at Lake Allom - some went for a 40 minute walk around the beautiful lake whilst some took a swim with the long necked tortoise. On our return journey we stopped at an unnamed lake which was choking with the migrating sand. The only visible sign of any plant lift was the Drossera which still flowers as it is carnivorous. The Toowoomba funnel web spider holes were noted in the embankment as we travelled along. On our return to camp our Fearless Leader showed us the way to become bogged at Aywina Creek. He had to rely on his loyal lieutenants - again - to be towed out with the snap rope. Kaye was the star at the time by finding a safe ford across the creek.� We all returned to camp and happy hour to be followed by chicken & sweet corn soup, rice paper wraps & strawberries & cream. Boil No 20 chicken covered with water till tender approx. 1 hour, remove chicken and place shreded flesh back into saucepan and add 6 cans creamed corn, mix 2 packets of chicken noodle soup 2 pkts french onion soup add more water to ensure thick consistency. Serve and enjoy with a light Chardonnay. Having been undecided about joining the planned walk to Bowarrady we were very glad we did. The track, which began, immediately beside the camp was once a vehicular track which has been closed to traffic 8-10 years previously. The first 3-4km section was through overhanging trees mainly allocasuarinas and eucalypts with a rich understory.� Occasionally, as we followed the Bowarrady creek we passed small ferns full of soft green coral form. At other times there were areas of low Banksia robur. The track itself was wide, firm and covered in leaves making walking a pleasure. The next section of about 2 km was less easy as we had joined one of the regular vehicular tracks where the churned up sand was deep and soft. It was a relief to get back on to the walking track, which took us on to the final 3km of the walk to Lake Bowarrady, even though in parts it was quite steep. A number of recently tunnelled holes caught John's attention and he pondered whether burrowing bettongs might have made them. Rats were another possibility. Throughout the walk we'd also seen lots of ant nests made by some of the 400 species of ants found on Fraser Island which John said almost equalled the number of plant species. The last part of the walk started Lake Bowarrady to the other side where there was a clearing and easy access through the reeds for those wanting to swim. We had our picnic lunch in the lovely shaded clearing even enjoying a cup of tea, which John had carried in the thermoses. 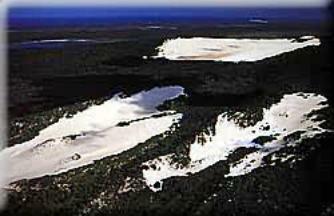 Quoting from his book Lake Bowarrady has an altitude of 120 metres making it one of the world's largest perched dune lakes. It has a depth of 3.3 metres and a pH of 4.65. Fringed by melaleucas which picked out the adjacent rainforest, Lake Bowarrady offers a rich experience to those who make one of the walks to reach it! A sentiment shared by those of us who did. From our lunch spot we could see the resident musk ducks on the lake and a sea eagle watching from a nearby tree. The sighting of a Regent bowerbird flying across the track soon after we began the return trip and the Black-breasted buttonquail Bill saw almost at the end of the walk were two most interesting of the birds we saw. Altogether the trip took 3 hours each way so the dip in Bowarrady Creek at the end of it was welcome indeed. Another magnificent meal and rounded off the day a splendid night of entertainment - Russell and also a rendition of the �Fearless Leader's Hat�. Camp struck early at 8am. Only drama was that some poor soul was stuck in the loo without any toilet paper. Hells bells!� Some pink paper was found, What do the men do? Use gum leaves? ALL ABOARD.� John crossed the creek with great gusto. Shortly after that we observed a spare wheel floating down the creek, the result of it being struck by a rock. Cable & clip were broken, and the troops disembarked and watched and paddled around looking for it. Tyre rescued, tied on top of Bill's vehicle & we convoyed up the beach. The trip highlights were 40,000 year old turpentine stumps in the beach, coloured sands varying from white to orangy red, xanthoreas, green flowering callistemons and casuarinas all on the dune side of Platypus Bay. Along the way we squished through stinking algae. Crossed Wathumba Creek at low tide.� No probs. Birds sighted were Osprey, Golden Plover, Curlews, Tattlers, Cormorants, Rainbow Bee-Eaters, Royal spoonbills, Ibis & red capped dotterels.� Morning tea in the Wathumba picnic site.� Low exposed estuary especially for bird lovers. Left about 10:25am going east across island through Dune system 3, we travelled along leaving a vast swamp down on our left, John pointing out the various trees. Shaky sand track sent the bums up & down on the seats. Dropping into dune system 6 there was a huge coverage of Banksia serrata. Drove into the outskirts of Orchid Beach �development�, over corduroy roads and viewed some amazingly ugly buildings, even saw a gnome dingo resting fiercely in a garden. Then into the more desirable part of Orchid Beach even bigger houses, but still inappropriate.� On to the rocky headland of Waddy Point which we climbed and were treated to great views of Sandy Cape. About 20km to Dundubara. Quick unloading experts now and at putting up tents and straight into lunch. Dingo info. sheet given to all to read. Later some folk went off to Cathedral Resort Mini-market for supplies. Much needed 50c pieces were sought for a lovely hot shower - something we were all looking forward to! Prior to happy hour a quick stroll up to view Wungal Sandblow, followed by three course dinner. The day began for Marie with a walk through the bush to Wungul Sandblow at 4.45 am. It was reassuring to her to see two dingoes shyly get out of her way along the track. As she got on to the sandblow, there were dingo tracks in the sand and an animal only about 20 metres away.� A second dingo soon joined this.� Up on the ridge higher, there were four more, motionless, surveying their domain. At this point Marie decided to postpone further exploration of the sandblow, and returned to camp. Ted was about to set off on a journey and joined Marie on a second trip to the sandblow. Rob followed, and the three went as far as the end of the sandblow where arms of the forest, partly engulfed, marked its present limits. The group activities began by going along the beach to the Pinnacles, buttresses of coloured sand eroded in places, showing successive strata deposited over time. Then Eli Creek, channelling 33 million gallons of crystal clear water every 24 hours. This is a fast-flowing stream rising spontaneously from the water table, providing a flume for the enjoyment of the hordes of beautiful lithe young bodies and a triple thrill for four more ancient partakers, while the onlookers sipped morning tea and watched the passing parade. As we left Eli Creek, we got buzzed by a plane which was coming in to land on the beach. John detoured to show us Happy Valley township where we counted 18 trail bikes. 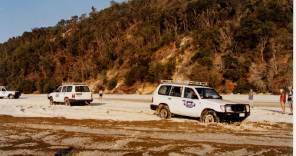 On the way along the beach to the Poyungan Valley we stopped to collect wongs (pipis). After doing a few unplanned donuts on the beach, we finally found the track. On the way to Lake Garrawongera, we stopped to look at some satinays, examine the subsoil and spotted the first of three emerald doves. After a restorative swim in the clear water of the lake, we had our usual lunch and were treated to the cacophanous display of trail bikes which had sadly reappeared. We walked through Yidney Scrub, one of the few remaining areas of pristine rainforest on the Island.� Everyone found this was a very special, relaxing, almost mystical experience. Somewhere along the way, we passed the Valley of the Palms. On the way home we followed the Scenic Drive which took us past Boomerang Lakes which, with an elevation of more than 180 metres, are the highest permanent perched dune lakes in the world.� We also passed 'The Delclivity' and the scarred scribbly gums in an area dubbed by John 'Lightning Ridge'. We drove through more tall rainforest on the Woralie Track. Here, almost the entire group was inveigled by John to snort a few lines of clematis (headache vine). After this, the other three vehicles were left far behind, prompting Bill's lot to ask if John's passengers were white-faced with terror as they hit only one bump in three. 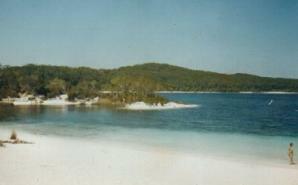 We stopped to gaze in awe at the Knifeblade Sandblow, the biggest on the Island. 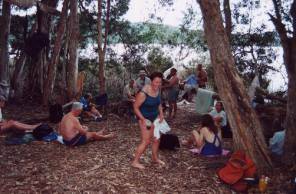 Then we rejoined the beach at the Pinnacles and returned to camp to find a fire already lit by Margaret.� Later on, after dinner, singing led by Russ was greatly enlivened by Peter who was in full entertainment mode. Ranger Tanya: "What was he doing?" Helen C: "Washing his face"
Ranger Tanya: "Is he a messy eater?" After a somewhat muddled start, we gathered pipis and admired the Cathedral coloured sands on the way to Indian Head, which we climbed. There was a great view to seaward with ospreys, kestrels and a sea eagle, and on the landward side there was the long extent of the Tuckee Sandblow. On the way from Indian Head to the Sandy Cape Lighthouse we had a relatively easy passage through the Ngkala Rocks at their lowest level encountered in many years. We saw a male turtle beached at Sandy Cape and then went on to climb the Flinders Sandblow, 150 feet high with a slope of about 30 degrees. The lighthouse itself stands about 430 feet, relies entirely on solar power and is part of the network around the Australian coastline maintained by the Australian Maritime Safety Authority (AMSA). We met the volunteer observer who supplies three hourly meteorological readings, except at 12 midnight, to the Bureau of Meteorology in Melbourne. The rain disturbed the swimmers in their first plunge at Ocean Lake. Lunch was eaten around a table protected by two tarpaulins against wind and rain.� After lunch we did the 1 km walk. We then drove to the Champagne Pools where we did the boardwalk. We were very lucky that the rain had driven other tourists away, as usually the area is extremely crowded with backpackers. We had an uneventful night except for the activities of a brown tree snake which crossed the road and stretched 40 cm to a low branch and disappeared into this. All of this was recorded on film by Bino Bill. In the morning Judith appeared with a pirate patch over her eye and all were ready to go by 8.30 am. John started by going to visit Auntie Norma at the local store and the rest of us drove to Eli Creek and on the way saw three Brahminy kites and two gull billed terns amongst lots of crested terns. At Eli Creek a number of us did the creek swim up to three times while waiting for John.� Others waded up the creek. Continuing down the beach we turned west up the Bogimbah Road at Poyungan Valley where we followed a road which was a former graded timber rail route through the forest. Then we followed the Bogimbah Creek until we turned off and went up "Telecom Hill" for morning tea. There we had a lovely view over Great Sandy Strait and the Kingfisher Resort and over Woody Island to Hervey Bay town on the mainland and Mt Bauple beyond. We looked down on Boon Boon Rocks where Aboriginals got chert and then north to Moon Point. Then we went down to a favourite bridge of John's over Bogimbah Creek and its pretty scenery.� We continued on to the mouth of the creek and looked over the bay with its mangroves in the foreground. 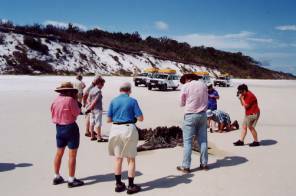 There are 14 types of mangroves on Fraser Island.� FL searched for old aboriginal graves and found only one but believes there are many more to be researched. Then we went to the site where the aboriginal mission had been and on to a site where logs were loaded on to barges at the creek side. After that we saw the old tin hut where Hans Bellerts lived and repaired telephone lines. For lunch we all stopped in the middle of the road near Poyungan Creek and prepared lunch on the bonnet of one of the trucks and on a pile of crates. It was our first meal in the middle of the road. After lunch we went to the big stump and the Valley of the Giants where we had a good walk along the road to enjoy the tall trees and to wait until a wheel on Russell's truck had been replaced. The very bouncing roads and their questionable effect on our livers led us to Lake McKenzie about 4 pm as the sun was leaving the beach. Then we headed for our exclusive camp site at Central Station and had to "negotiate" a locked gate to gain access. As the dinner was being prepared a limping dingo went into Margaret's tent and made off with her cake of soap.� During dinner Ranger Neil turned up and talked about dingoes and their local habits. The day started early for most of us with some walking out to Basin Lake for an early morning swim at this very beautiful lake. During the night, dingos had been in camp and made off with a bottle of soy sauce and a small bottle of methylated spirits. We will keep our eyes open today for a pissed dingo of Asian Persuasion. After breakfast all except Russell and Graeme set off on the walk through the Pile Valley along Wanggoolba Creek.� We were treated to sightings of eel, land mullet (related to the blue-tongued skink), a baby goanna, yellow robin. We passed giant syncarpias and measured one as having a 10 feet diameter and 35 feet circumference. Some of these piles from the syncarpias were used in construction of the Suez Canal and Tilbury Docks. John told us about the drilling some 60 years ago when searching for oil, which revealed that the sand island was some 2000 feet deep. We then moved on to Sid Melksham's Eurong Resort to refuel the vehicles. Eurong Resort was memorable only for its unimpressiveness; a testament to bad taste and totally out of character with the ambience of Fraser Island. We returned to the beach highway where we sighted Caspian Terns among the many Crested Terns as well as Common Terns, was migratory birds from Europe or Asia to Australian east coast estuaries and islands. We also saw a juvenile spotted monitor with ticks, probably heading for the saltwater to remove the ticks.� Hope this little beauty survived its journey. On the way to Lake Boomanjin, John showed us an area last mined in 1976, which had been restored by the miners to the best of their ability. The contrast between the unmined forest and the rehabilitated area was stark. The lack of understory and the relative paucity of the variety of trees were quite striking. 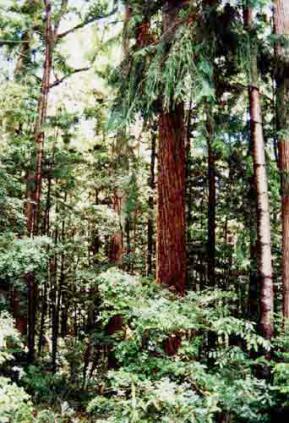 However, we saw beautiful blackbutt plantations in the mined area.� John was surprised that these trees had done so well. However, he estimated that only 5% of the hand plantings had survived elsewhere. 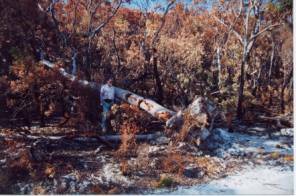 Ironbark seeds had blown in and the trees were surviving but with a long way to go.� We passed by Tobys Airstrip which had serviced the sandmining venture. We then went on to Lake Boomanjin where we walked out on to the Lake and saw the Utricularias the roots of which look like slime but produce pretty little blue flowers variously named "ladies slippers" or "fairies aprons." 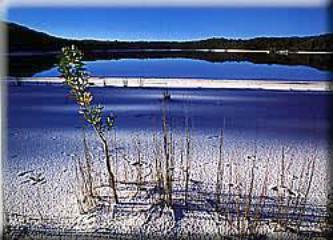 John explained the difference between some of the Lakes.� Lake Boomanjin has a very low pH reading of 4.8 due to the lack of calcium and other nutrients. Some remarked on the lovely Bridal Bush in flower and fruit. We then lunched at the Lake Boomanjin camping area - along with about 50 children from Ormiston State School - the birds loved them. On to Lake Birrabeen after lunch for a much awaited swim. This must be one of the most picturesque Lakes but is totally spoilt by the roar of buses parking and disgorging hundreds of tourists. Something must be done to move the buses away from the lake side - the tour operator - who shall remain nameless - is the only operator permitted to use the lake side access. Ungowa was the next port of call.� On the way we passed ancient fens just in from the roadside which are thought to be the oldest fens in the world.� We didn't venture in to this mozzie and sandfly infested world. At Ungowa we saw the remains of the old shipping jetty and had a view north up the Great Sandy Strait. Back into the buses and a drive home to Central Station with the lovely late afternoon light playing across the roadway and amongst the forest. John, Russell, Bill and Graeme have RSI now as all John's books have been signed and maps of our travels marked out during happy hour. We marked the final evening together last night with a concert around the campfire. Russell introduced each item with the humour and finesse we had come to expect and later sang a few songs as well. Helen Coutts delighted us with appropriately, the Eriskay Lovelilt and Isabel with some lovely Joan Baez ballads while Edith Piaff herself would surely have applauded when Marie sang �La vie en rose�. The Victoria Cabbage Patch Choirs with Margaret conducting managed �Kookaburra Sits in an Old Gum Tree� without completely losing control.� Then there were some jokes by PEC and FL plus a series of cautionary hotel signs from Rob. The evening would have not have been complete without some Banjo Patterson and here Karin and Bill excelled themselves. Bill added though a more colourful verse about a rough-rider�s experience of �Turbulence�. Before we went to bed John suggested we wait for the dew to dry before packing up the tents next morning.� In the event however there was little dew.� Instead heavy raindrops caused a flurry and we broke camp in record time to be away by 9 o�clock. There was a plane on the beach near Eurong as we turned north to Lake Wabby. When we reached the parking area two buses used to carry school children we�d met yesterday were already there. We were to meet columns of these youngsters coming towards us across the Hammerstone Sandblow like something out of Lawrence of Arabia. The path we followed in from the beach was parallel to the track used by John�s parents in 1935 when they drove a T model Ford to Lake Wabby, which incidentally has since been filled in by sand to form two lakes. As we walked through this littoral section John pointed out many plants of interest. 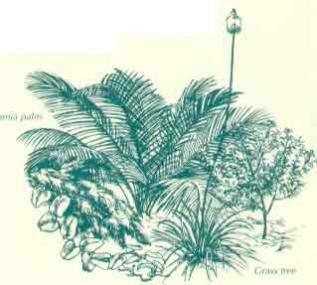 The cycad was one of these. It is very primitive and is pollinated by only one species of beetle.� The Aborigines used seeds to obtain flour.� However because of the presence of a toxin, this had first to be leached out by soaking the crushed seeds in running water for some days before drying and pounding. 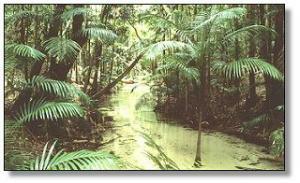 Other primitive plants for which Fraser Island is a refugia include aurcarias, syncarpias and angiopteris. We also noted the adventitious roots on many ancient melaleucas developed to enable them to survive being engulfed by the sandblow as it moved on. A little further on, using a broad blade, John dug a hole in the sand to demonstrate the adherence of sand to fine organic filaments called hyphae. These are a fungi known generically as micorhiza which emit electronic charges neutralizing the negatively charged iron coatings on the sand grains thus enabling plant roots access to positively charged nutrients (phosphate and potash) previously unavailable to them. It was quire a pull up Hammerstone Blow and we were glad it was a cool overcast morning. Towards the top we saw fragments of charcoal indicating Aboriginal fireplaces. There were also signs of middens in the scattered pipi shells and a tool making area with scattered thumbnail sized scrapers made from chert, giving the blow its name.� In addition an outline of humate rock suggested an ancient dried up perched lake. Another highlight of the Hammerstone Blow was the huge spreading melaleuca at the top which John estimates as high as the blow itself and therefore competing to qualify as the world�s tallest flowering plant. This has yet to be proved but it is an exciting prospect. We plunged steeply down to the edge of Lake Wabby where people, catfish and tortoises were swimming.� The walk back to our vehicles was through pleasant light woodland, again made interesting by John�s commentary.� At the end we were rewarded by seeing a pod of whales passing close to the beach. After lunch at Dilli Village we headed down the beach past areas of previous sandmining until we arrived at the barge crossing. By this time the rain had begun to set in. On the Cooloola side we travelled by road as far as to Rainbow Beach before turning off again to the beach driving along it almost as far as Noosa Heads. Along the ways we passed the wreck of the �Cherry venture� where these days ice creams are available! The rain was really heavy by then reducing visibility considerably while sheets of fresh water seeping out of the dunes would have challenged any but our intrepid drivers.� On we charged past numbers of campers sheltering close to the dunes. John deplored their presence. Memories of a magical island and a privileged experience will remain with us. Our thanks to John, Russell Graham and Bill. Will we see the humpbacks play? Will they nose the surface and spy? Are these cetacean songs or rhyme? To rendezvous with Fraser Dawn.